The Newest Rant: Wizard World Saint Louis Starts a Week from Today! Wizard World Saint Louis Starts a Week from Today! 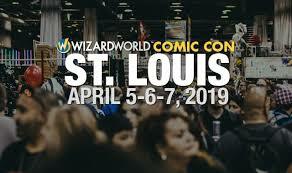 As of today we are now just a week-or-so away from the start of Wizard World Saint Louis. I always enjoy attending the show and plan to be there yet again this year, reporting on all the cool folk I meet, great cosplay I witness, and awesome stuff I acquire. With guests including but not limited to Jason Momoa, Chris Kattan, Ty Templeton, Holly Marie Combs, Lou Ferrigno, Arvell Jones (co-creator of Misty Knight), Ernie Hudson, Alaina Huffman, Rick Burchett, and Sean Astin, there are lots of people to see in addition to enjoying the usual cool assortment of vendors, programming, and other fun stuff. The show will run from 4PM-9PM Friday, 10AM-7PM Saturday, and 10AM-4PM Sunday at the America's Center, 701 Convention Plaza, Saint Louis, MO, 63101. You can buy tickets for the show as well as VIP or photo packages with the guests at this link. I look forward to seeing everyone there!